Carolyn Cesario and Julie Sullivan’s nut butters are so delicious, you forget they're super nutritious. We know nut butters are super nutritious. But when we eat them, we feel like we're sneaking dessert. When we tasted Carolyn Cesario and Julie Sullivan's versions, we KNEW we were. With a few carefully chosen ingredients added to flavorful roasted almonds and cashews, they've created swoony yet healthy indulgences for spooning straight from the jar, adding to oatmeal and smoothies, or spreading on fruit or toast. After developing a passion for nutrition and wellness through dealing with her own health issues, Carolyn began to notice a gap in the marketplace for nut butters made with simple ingredients and original flavorings, without additives, sugar, or peanuts. She began making and selling her own to friends and family. Meanwhile, Julie had recently returned from Uganda, where she developed and implemented an employment training program for 160 women overcoming poverty. She saw the opportunity (and need) to implement a similar program in her home community of Portland. All she needed was the right product. Then she met Carolyn. They started their business as a social enterprise to provide women overcoming adversity with an opportunity to get back on their feet through employment. As a for-profit business, they provide job skills training with a 6-9 month employment training program that provides a stepping stone into full-time employment, all by making and selling nourishing nut butters that taste like luxury indulgences. No need to refrigerate. Stir if separation occurs. 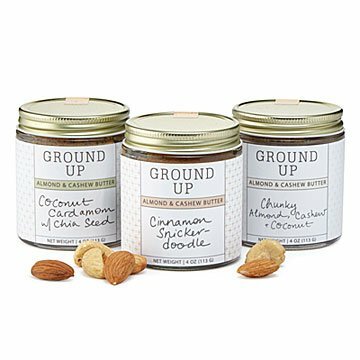 In spite of the price being a bit high for the quantity of nut butter in this three-pack, the unique flavors are delicious and are very well packaged. Five stars for flavor...three stars for price...which averages to four stars. I used these butters on EVERYTHING! Well, almost.